PCEC learns about bio technology; a new field of science that involves making old products and technologies with new technologies, that is both healthy and planet friendly, plus it must be cost efficient, as well. The goal is to provide a bridge between environmental science and business goals. The focus is on safety and is inspired by nature. 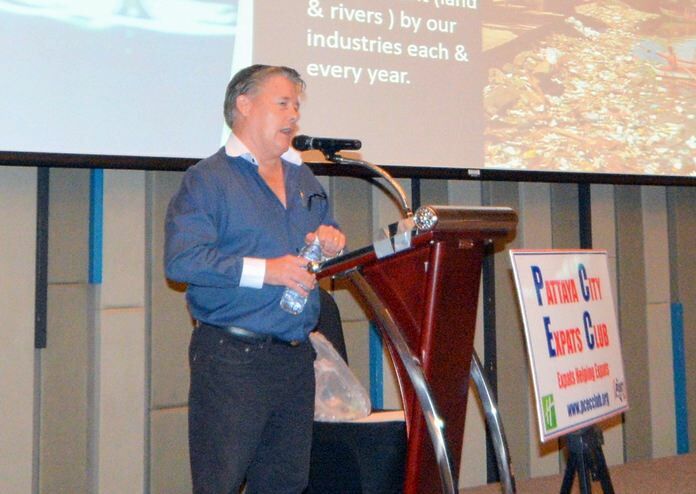 This was the message presented to the Pattaya City Expats Club by David Smith, managing director of the biotech company Focus Safety Co., Ltd., at their meeting on May 7. He explained how bio technology experts have developed a non-toxic alternative to some toxic chemicals. David Smith explains to his PCEC audience how bio technology allows the non-toxic replacement of toxic chemicals. David says bio-technology is as much a part of our planet’s future as motor cars, airplanes and the internet, in getting us to where we need to go. The next steps forward, in our combined futures, are all about being earth-people, using health friendly technologies that can overtake the old, toxic, carcinogenic and short sighted chemical systems of yesterday. 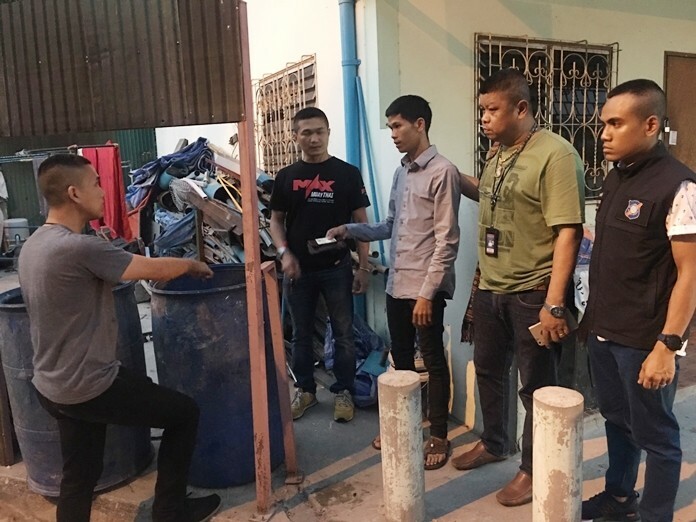 Since the turn of the century (2000), David has been general manager for an Environmental Department with a mid-sized international company, PMCi Corporation, which was then based in Jomtien. 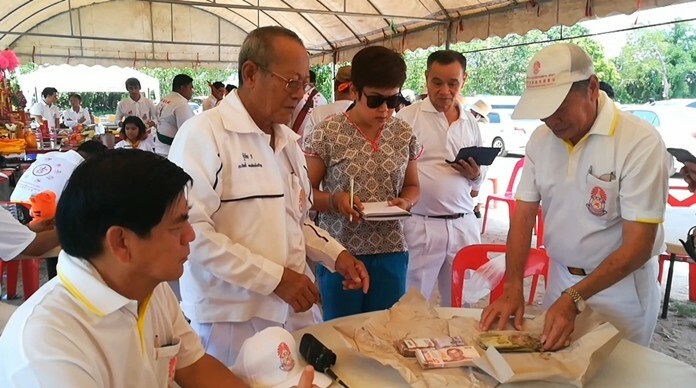 He is now one of the current owners and managing partner/director of the biotech company, Focus Safety Co., Ltd. David has lived and worked in Thailand since 1995 and has been permanently living in the Banglamung region since 1999. During his presentation to the PCEC, David Smith with Focus Safety Co., Ltd., notes that his company emphasizes that in their development of bio-polymer polymers, they use the following in priority order: People, Planet, Profit. 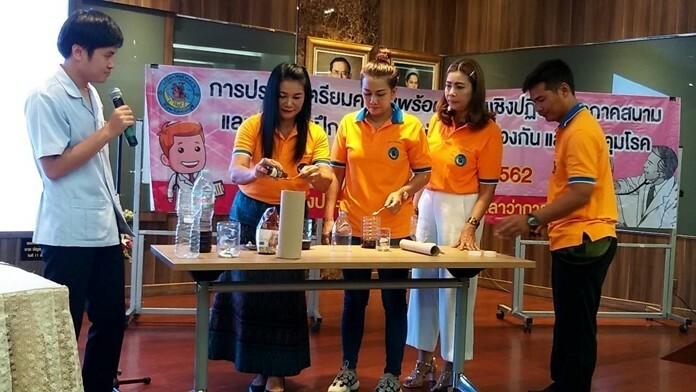 In 2010, Focus Safety Co., Ltd., was established in Banglamung, and is involved with some of the leading international scientists and organizations in dealing with bio-polymer technologies. David believes their goals are much more achievable in Thailand than in most western countries, due to the ability to better streamline a path around the big corporations, with their inherent stranglehold over government certifications and acceptance. The business goal is to create alternatives to highly dangerous and toxic chemicals, in all aspects of business, commerce and agri-businesses, especially plastics. Today’s conventional plastics are made from hydrocarbons, which are derived from oil and gas, extracted from the ground, which took millions of years to create. An alternative to conventional plastic is a bio-polymer product that is simply a structure primarily formulated around bio-degradable components, called monomers. Nature has been creating and evolving bio-polymers for about 5-600 million years and some of those include: DNA, starch, Polysaccharides and sugars, which are ALL examples of bio-polymers. Within the last 20 years, scientists have been able to emulate the creation of bio-polymers into more useful products such as a new type of plastic that is made from starches and amino acids, rather than the old hydrocarbons. MC Roy Albiston presents David Smith with the PCEC’s Certificate of Appreciation for his informative presentation on bio-technology and some of its current uses. Today, Focus Safety Co. is concentrating on the fields of sanitizing and disinfection processes. Basically, they are working with scientists to provide new technologies to eliminate, control and protect against microbial infection, by using smarter bio-polymers. In the past, microbial infections were treated by simply throwing toxic chemicals at the problem. That’s a big deal, because not only do toxic chemicals actually kill nasty microorganisms but they are also as dangerous to the good organisms, such as plants, animals and humans. Another huge issue, which may be helped by advanced bio-polymers, is the reduction of the constant pollution to our planet. It’s not just trash, but it is the type of pollutants that man and businesses spew into our environment every year. There are 315 million tons of plastics dumped into our oceans, 3.24 million tons of toxic chemicals are released into the atmosphere and 140 million tons of toxic chemicals are released into our land and rivers, every year! Bio-polymers can reduce the toxic chemicals, as well as reduce trash by the quicker bio-degradation process. 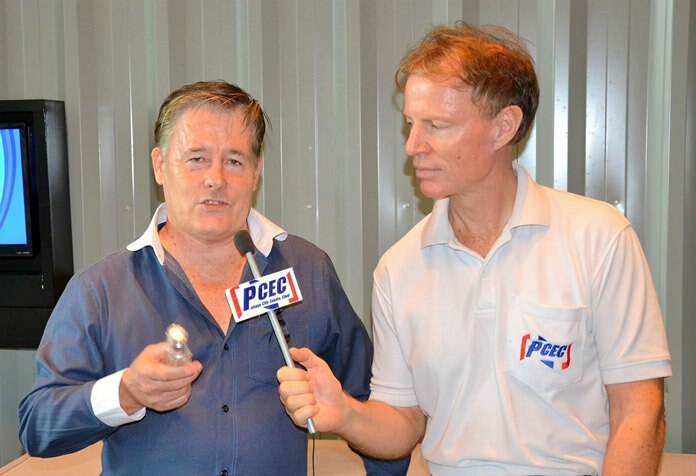 Member Ren Lexander interviews David Smith about his presentation to the PCEC. To view the video. Focus Safety Co., Ltd., is the master franchisor and technology provider for BioPools, which provides swimming pool services in and around Pattaya, Jomtien and Banglamung. BioPools uses the latest bio-technology to replace the need for chlorine or salt water chlorination, for not only swimming pools, but for any standard water treatment process. The BioPools Company is developing alternatives to chlorine and Trichloroisocyanuric Acid (TTCA) methods of disinfection and purification of water. Dave points out that chlorine can kill almost all life forms, including humans. 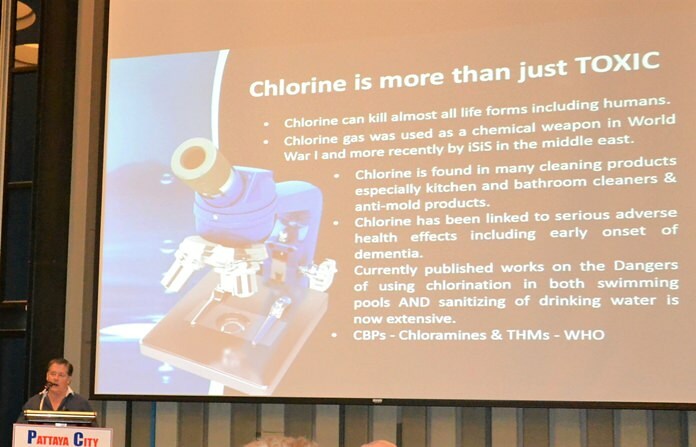 Chlorine gas was used as a chemical weapon in WWI and more recently by ISIS. Chlorine is found in many cleaning products and has been linked to serious adverse health effects. Dave believes their proprietary product, BioFresh, offers a cost competitive alternative to chlorine products. It can be used for all types of water treatment, including industrial, commercial/agri-business, residential and drinking water. BioFresh is a bio-polymer, therefor it is not toxic, easy to handle and requires only a simple, liquid dose once a week and can be applied rain or shine. It is tolerant to sunshine, hot climate and water chemistry. It is health smart, planet friendly and has no taste or smell. A video was presented that demonstrated bio-compatibility when turtles and fish were added to swimming pools, with no ill effects. 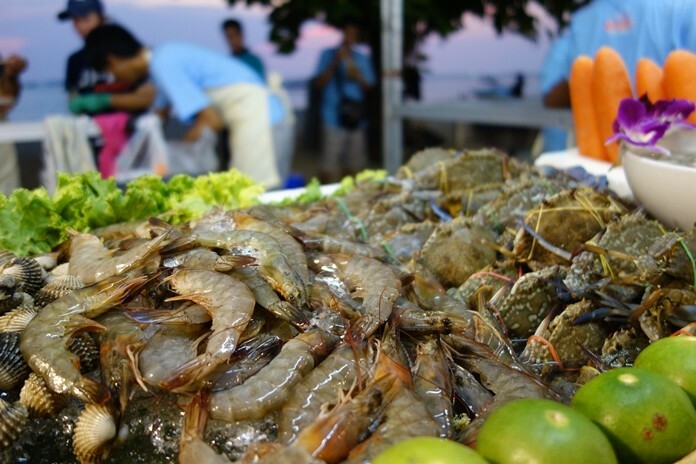 They are currently testing the product with the world’s largest shrimp farming corporation, which just happens to be Thailand’s second largest company. 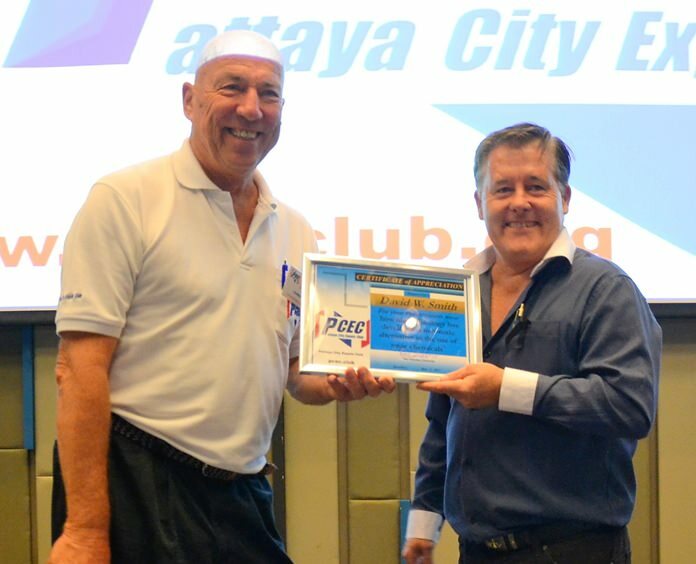 After the presentation, MC Roy Albiston updated everyone on upcoming events and Ron Hunter conducted the Open Forum where questions are asked and answered or comments made about Expat living in Pattaya. For more information about the PCEC, visit their website at www.pcec.club. 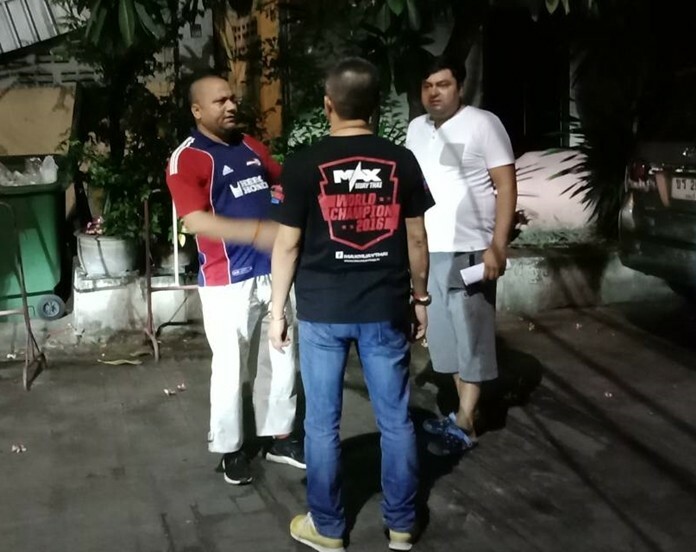 Previous articleBest show ever to come to Pattaya – Ever!